In the online shopping world, there is one thing that you may notice. Clothes, toys, jewelry, shoes, personal care products, electronics, video games…and the list goes on. What do you notice every time you go online to look for a product you want? Does it feel like a traffic jam on the highway? The brands that stand out are…the ones that are different. The brands that make people think (or say out loud) “huh, what’s that” as soon as they land on the site. How do you do that as an ecommerce brand? You find ways to not only stand out from the crowd, but stand apart from the others by telling a great brand story, making each experience “personal” for each visitor that crosses your online threshold, AND being so exclusive that everyone wants to get in the club. You could talk about facts and data. You can talk about the features of your products all day long. And when you do that, you think you have the edge – right? You know the hell out of your product! But…it’s not the features that creates the emotional connection. The allure. Viberg shoes has such a cool concept for being a craft shoe company. A company that’s been crafting boots for over 80 years. 80 years. Making shoes! And still in business. This native Canadian manufacturer has adapted their business throughout the years and today has become an Ecommerce force of nature. Their service boot is a throwback style originally designed by the founder himself, Ed Viberg. Designed by our founder Edwin Viberg in 1931. A similar pattern was used by multiple nations as a standard issue military boot during WWII. The 1930’s were notorious for classic well kept men like Addicus Finch never rethinking his position on an issue. His cool demeanor even during the most heated trial in Maycomb County, Alabama’s history. And his style. Who wouldn’t want to dress like Peck…right down to his classic shoes. Our product, in particular, is so much about experience. Our boots are heavyweight and the materials have texture and character that can be difficult to capture in a photo. The feedback we always get from first-time customers is that they are impressed with how substantial the boots feel compared to other brands, so we have to pay careful attention to the advice we give and make sure the customer feels confident in their purchase,” Ferguson continues. In the image above, as you can see, I made a few comments to enhance the copy. I would LOVE to see their description bring their interested visitor into the middle of the story so they actually can’t wait to get on that waiting list to get their boots! Are you like everyone else in the online marketplace? “Well of course I am Christine!” I can hear you say. Now, If I do a search on you, what will I find? If I go to your website, what will I see? Edison, you know, the inventor of the light bulb and direct current electricity was all the rage of his time. Afterall, he was a world-renowned inventor. We want to believe that we are unique. That our products are the best in the world. That we STAND OUT just because we are, well…US. The thing is…more times than not, we are just like everyone else. So we’re afraid to be our fabulously quirky and original selves because we’re afraid someone will think we’re a big fat loser. Nikola Tesla, a young engineer working for Edison, decided he would embrace his originality. He set the emerging electric industry into HIGH VOLTAGE by challenging DC (direct current) with his new method of alternating current (AC). Dangerous, yeah a little. DIfferent, absolutely. Challenging to the status quo – DEFINITELY! You can’t get much different and quirky than a bed invented by a rocket scientist. You could say for Purple.com, necessity was the mother of their invention. But…a great video doesn’t sell products. Being true to your story, offering a uniquely different product and delivering on the promise to your customers…that sells products. And, it creates brand loyalty without PRESSURE. Does Purple keep their promise? When you look at the comments, it sure looks like it does. And then their is their stats. They don’t just know that their audience buys from their ecommerce site. They know that MOST of their traffic comes from mobile devices…and even sales…ON A PHONE! That’s innovation and keeping up with the times. Their website copy and content separates them from the average mattress crowd. And for a word geek like me, this had me at HELLO … I mean even the button copy is on brand! What makes your brand different? Pura Vida Bracelets was like any artisan brand trying to recruit reps to sell their products. They wanted people to speak for them, afterall, word of mouth by brand ambassadors is the best kind of marketing. So, they created a program. Like so many other programs, they followed the model of giving the ambassador/rep a swag starter kit. Each influencer would get their free kit with the expectation that they would post on Instagram, create the buzz and sell products to friends. 75% of our “reps” had never made a single sale. That meant only a quarter of our reps were active and engaged. When things aren’t working like you expect them to, you have to be willing to change the model! Pura Vida knew that reps and influencers were the way to grow, but how do you psych them to sell and motivate to keep selling? They never had any problem getting people to sign up…I’m mean SWAG…come on! And they compensated their ambassadors by giving them 10% commission on every sale. That’s nothing to gripe about. But this time…no FREE swag first. They had to change the model which meant finding ways to not only keep their influencers happy, but also keep them in swag with out giving away the farm. Not only were their ambassadors going to get their beloved bracelets, they were motivated by getting some tangible rewards! They also become part of an exclusive FB/Instagram group where they get to talk about being Pura Vida fanatics and show off their beloved rewards! And nothing motivates like EXCLUSIVITY! One of the topics Mike Michalowicz points out in psychology is that people like hearing their own names. Bringing visitors into our brand and then talking to them on a first name basis (not in a hype-y used car salesman way) does a lot for a brand’s loyalty. Let’s take a 350+ year old brand that needed some serious customer loyalty. They had to go out to local stores and attend classes, go to tradeshows, participate in anything craft related and spread the Fiskars goodwill. Those four told four friends, and then those four told four friends…and so on and so on. Because they liked what was going on. They like that a pair a scissors (and not just any scissors) made them a unique crafter. Those scissors were different…and BETTER. Our customers set us apart from the crowd. Our customers are our fans. Our kind of customers don’t want to run with the crowd, they want to blaze their own trails. They want permission to be as unique and original as we are. SO…we have a moral imperative to make sure that we create a brand that stands out. 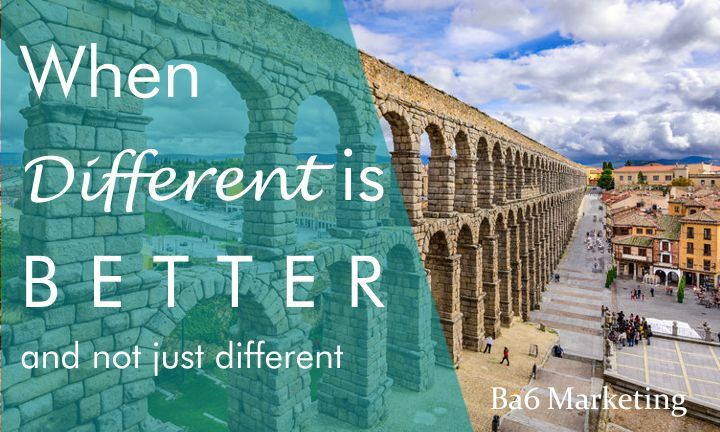 Different is NOT just different, it’s uniquely BETTER! If you like what you read and want just a little more delivered to your inbox with your name on it , CLICK HERE and add you name and email. I’ll personally present the tips and strategies to you. Some great ideas here Christine. Thanks for sharing. You’re welcome Cindy – glad the ideas are helpful! Absolutely STELLAR write-up. And great use of real examples and illustrations! Thanks Aaron – a little collaboration is invaluable! !